Results of a survey published in the British Medical Journal (BMJ) indicate that "about half of the surveyed internists and rheumatologists reported prescribing placebo treatments on a regular basis." Most often they prescribe harmless vitamins and over the counter analgesics. "Furthermore," say the researchers, "physicians who use placebo treatments most commonly describe them to patients as a potentially beneficial medicine or treatment not typically used for their condition; only rarely do they explicitly describe them as placebos" (see "Prescribing 'placebo treatments': results of national survey of US internists and rheumatologists"). 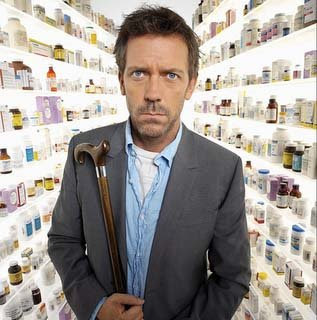 In contrast, fake doctors on TV, like Gregory House, the protagonist of the hit TV medical drama House, was caught prescribing Lupron off-label for hypogonadism, according to a Pharma Marketing Executive magazine insert article entitled "Drug product placements on TV shows: The Next DTC." I think pharmaceutical marketers would prefer the fake doctor's approach, which may explain why PE Mag thinks drug product placements on TV shows are on the rise. It may also be part of a growing trend in what New York magazine calls "product integration -- the latest fad in TV economics, the killer app meant to save TV from TiVo" (see "What Tina Fey Would Do for a SoyJoy"). BTW, before you dismiss product integration as a less effective form of DTC advertising than regular ads, consider this. According to two new studies released by the Kaiser Family Foundation, many television viewers are being educated about important health issues, while being entertained. Seventeen percent of regular Grey's Anatomy viewers — or about three million people nationwide — said that they had tried to “find more information” about a health issue or “spoken with a doctor or other healthcare professional” because of something they saw on the show. About three in 10 (29 percent) regular Grey’s viewers say they think the medical information on the show is ‘very’ accurate, while another 58 percent say it’s ‘somewhat’ accurate. Health storylines are much more likely to focus on symptoms (65 percent), treatment (59 percent) and diagnosis (50 percent) than prevention (10 percent). I'll bet if regular 60-second DTC advertisements achieved these kinds of soft metrics, they would be considered very successful. And product placement is so much less expensive -- no advertising agency production fees, for example!